After much work on the part of Fabalah, who does all the photos, the next tutorial is finally up. I would also like to extend a warm welcome to Eye of Error, a new member of the Artisan Alliance. So let’s get started! Here are all the paints I used in this tutorial. The dark grey at the top left is the old Adeptus Battlegrey, and the metallics in the middle are P3 Pig Iron, Cold Steel, Molten Bronze, and Rhulic Gold. I should mention that the only paint not shown here is Blazing orange, which I forgot to add to the pile. First, you’re going to want to prime the mini black. You can use white or grey, but this will brighten any colors you do. Basecoat all of the armour with Caliban Green. Begin layering with a 2:1 mix of Caliban Green and Warpstone Glow. For this step, I chose to apply the paint in areas the sun would hit, and leave Caliban Green in the shadows. Highlight the armour with Warpstone Glow. Add some water for this step, as you want to make sure the paint goes on smooth. This is the final stage for the green. Take some black paint (I use Matt Black from Army Painter) and shade between the armour sections. Be sure to water it down. Basecoat the red and metal areas with Khorne Red and P3 Pig Iron. Highlight the red with Mephiston Red. Wash all the metal areas with Quickshade Dark Tone or a similar black wash, then layer with P3 Cold Steel. I also took this chance to basecoat all the gold areas with P3 Molten Bronze. Wash the gold with Quickshade Strong Tone or a similar dark brown wash. Highlight the gold with P3 Rhulic Gold. Basecoat all the under suit areas with Adeptus Battlegrey, or the new Eshin Grey. Highlight the under suit areas with Dawnstone. Block out the sword with a t using Skull White. It’s important to make sure you get it roughly in the middle. Make that t look like an actual sword. Add the wings to both sides. Don’t worry to much about mistakes, you can always fix those later. Block out the feather parts of the wings. Again, don’t be afraid to clean up after your’e done. Clean up the wings with some Caliban Green, making sure all the edges and nice and flat, and the wings line up with each other. Basecoat the eyes with Mephiston Red. Try to be careful with these next steps, you don’t want to have to re paint that lovely face! Highlight towards the edge of the eyes with a 1:1 mix of Mephiston Red and Blazing Orange (Not shown at the start, my bad). Take some Skull white and add small dots to the top edge of the eyes. Basecoat with Rhinox Hide. Don’t be afraid to water it down, or use mulitple layers. Drybrush with a 1:1 mix of Rhinox Hide and Bleached Bone. Drybrush with Bleached Bone, focusing towards the outer edges of the base. Give the base a wash of Quickshade Strong Tone or a similar dark brown wash.
And with that, you are done your Dark Angel Space Marine. Hopefully this helps a few of you finish those Dark Vengeance box sets, or inspires others to start an army of the Unforgiven. Damn this is awesome, thanks for an another tutorial. I’m usually to running around to blog to blog looking for tutorials and I’m really liking the layout and the amount of time you have put in to make this. Looking forward to more so I can stop running blog to blog and maybe have a central place to go. Tutorials I would like to see: A guide on how to start painting (for the noobs). 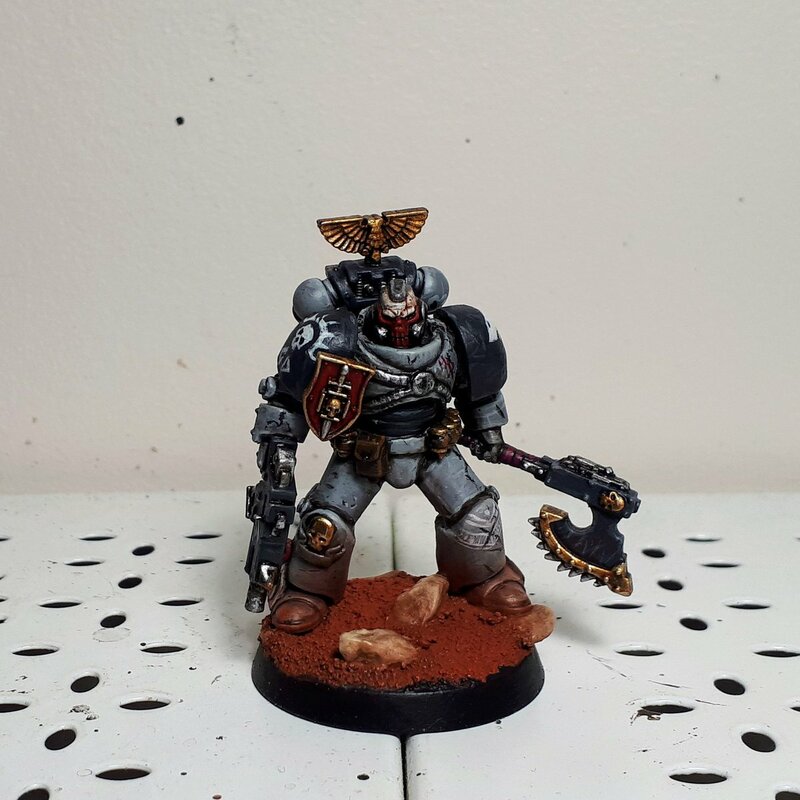 How to paint white and how to paint black (Whatever chapters are fine with me). Thanks again. I’m glad you like them! I have plans to push out a lot of tutorials. Hopefully one for every Legion. Thanks for the help painting the chapter symbol and the rest of the tutorial was a big help too. 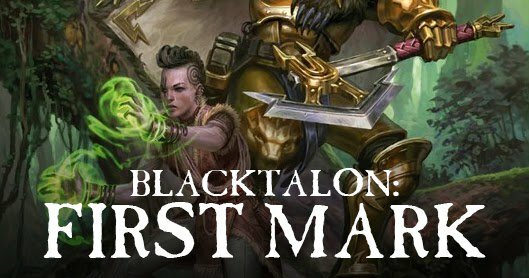 Very nice tutorial – especially since I’ve been eyeing that Dark Vengeance boxed set. I’m new to painting, but love Ultramarines. I wanted to paint the GW, but I’m a bit confused. Some tutorials use Macragge Blue as a base with their blue wash. After, the armor is cleaned up with Macragge again, followed by a highlight of Altdorf and a fine highlight of Calgar Blue. Other tutorials suggest cleaning the armor with Altdorf and just doing one fine highlight with Calgar. Any suggestions? I find that starting with Macragge blue is often a little dark for my tastes. I would start with a base of Caledor Sky, then give it some broad highlights on the top areas with Hoeth Blue. Then highlight Fenrisian Grey, and put some watered down Kantor Blue in the recesses. I will see what I can do about a tutorial for the Ultramarines. An Ultramarine tutorial would be great. They’re a classic which many people consider cheesy, but I think they’re amazing. Thanks for the color suggestions. I dont know why, but I didn’t consider Caledor Sky. Do you base with the standard “sand” approach? Have you tried the new texture paints from GW? I have not gotten around to the texture paints, but it is on my list. At the moment, I have a small tub of sand that I use, and that seems to be working fine for me. Very nice tutorial you got going there. It helped a lot with my Dark angels and I am highly impressed with the chapter insignia and the eye lenses. Thanks. I’m glad to know it helped! I was planning on doing a newer Blood Angel one for Space Hulk, then a Deathwing one, and see where it goes from there. Ultramarines are on my list tho! Awesome detailing. I do a few Warhammer 40K miniatures for the heck of it (mostly Dark Vengeance models), and I think it’s awesome how realistic (for a little painted thing of plastic) it is. Great job. I’m glad you found the tutorials helpful! We’ve got some plans to do a Deathwing and Ravenwing tutorial, but we will see what the future holds on that. Feel free to post some photos of your Dark Angels on our Facebook page, I’d love to see them.